The “fash-lite” English Democrats have announced that David Wickham will be their candidate for the parliamentary by-election for the Corby seat, to be held in November. Wickham’s main concern will be to scrap with the BNP and UKIP for votes, as the ED is attempting to carve itself a niche in the grubby world of nationalist politics. Expect a fair measure of further right-wing infighting as the election gets closer. It’s not just the Leicester EDL and casuals who are splitting up this week. 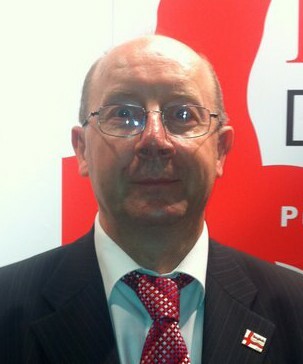 The English Democrats have enraged the BNP by inviting hated former BNP crook, anti-abortionist and loyalist, Jim Dowson, to do a PR campaign for them. This has involved using the BNP membership list, which it is rumoured that Dowson still legally owns, to spam existing BNP members with letters inviting them to join the EDs. Rob Walker, recent convert to the EDs from the BNP is “furious that this has happened” and Northants BNP members are none too happy either. I for one think the prospects of the ED,s are no better than that of the BNP. I could never join a party with that odious man Eddy Butler involved. The media woud give the ED,s the same treatment they have given to all nationalist groups that have had any hint of success… Once the media realise that ex BNP members are involved they will let rip. You will be back to square one.There are reports of many original ED members leaving because of the influx of ex BNP with many southern members quitting leaving a few former BNP branches in Yorkshire as their main areas of strength. its only a matter of time before splits and divisions occur. All that will be left is a clique of ex BNP whos sole reason for being there is because they dont like Griffin, hardly a motivation for success. ED,s, no thanks, not for me. There are reports of groups like Britain First and the EDL starting to fragment,even the ED,s are showing signs of internal strains. Rest assured that as soon as the English Democrats are seen to present any threat to the established parties they will become the target of such attacks. As this party becomes more well known and starts to stand more candidates for election expect ever more from the “Dirty Tricks Brigade”. [Dowson’s involvement] and having Butler proves the EDL is just as rotten as the BNP. This is just another political party and that will let you down. We couldn’t agree more. It doesn’t matter what stripes these fascists brand themselves with, they remain fascists and will be targeted for anti-fascist action. That is why ourselves and other groups are increasingly focusing our attention on the English Democrats. They may be enjoying a temporary lull whilst the general public catches up but they can rest assured that they will become as hated as the BNP before long. Walker joins the North West Leicestershire branch of the BNP who jumped ship in April and Boston councillor, David Owens, who defected before last year’s elections. As many as 43% of the English Democrat candidates in May’s local elections were former BNP members, hoping that they can avoid the “toxic” fascist label by donning a different coloured rosette.